Artist A. Plastov was very fond of the village, rural life and ordinary people, and he devoted many of his works to this very thing. One of them is the familiar “First Snow” painting. On this canvas, we see a sketch from peasant life: a village house, a front garden, an old tall birch, a frozen puddle, a crow, and other hut in the distance. It is snowing outside and, judging by the fact that the whole earth is already covered with a soft snow-white carpet, it has been going on for a long time. On the threshold of the house came two children: a little boy and a girl a little older – apparently, brother and sister. 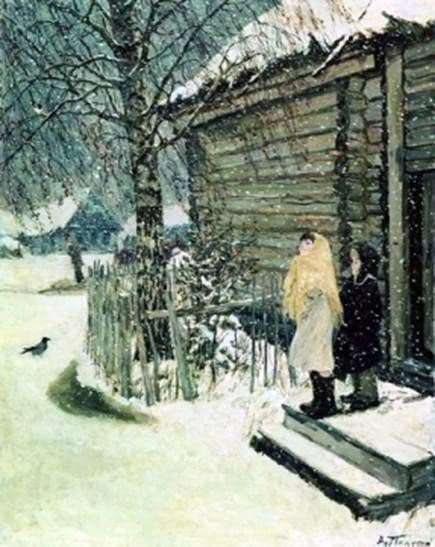 The children froze in place, amazed by this magnificent and, probably, long-awaited spectacle – the first snow. They are fascinated to see how thousands of snowflakes smoothly spin in the air in a slow waltz. On the faces of the guys happy smiles – such as can be only for children who have not lost the ability to enjoy the pleasant little things and the beauty of the world around. Their innocent pure souls seem to be in harmony with the dazzling whiteness of fresh snow. Most likely, the guys saw snow in the window, and then, in a hurry, dressed, ran out into the street to admire this beauty. The girl threw a yellow woolen shawl over her dress, and her brother dressed a little warmer – in a coat and hat. Children have boots on their feet. Snowflakes gently touch their reddened faces. Above the heads of the heroes of the picture is a dark blue sky, but even overcast, as it seems, the weather is not able to deprive children of the feeling of exultation from the coming winter. Meanwhile, the snow has already transformed everything around: the ground, the spreading branches of a birch tree, and the roof of the huts, and the threshold of the house. Even the old ugly wooden hut seems more beautiful and more comfortable under it. Interestingly, the picture was painted by the artist in a rather monotonous and stingy color scheme. He uses mostly white, gray and brown tones. However, this does not make her sad. The happy faces of the children bring a sense of joy and warmth to the picture. Looking at this canvas, it is impossible not to feel the joy that seized the children. Still: after all, winter is a wonderful time when you can skate from the mountains and skate, sculpt snowmen and play snowballs! Everyone looking at this picture will involuntarily remember their own childhood and the forgotten impressions of this little miracle – the first snow.